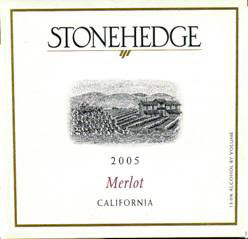 2006 Stonehedge Merlot California is a blend of 89.3% Merlot and 10.7% of Syrah and Sangiovese. It somewhat brings to your palate the roundness of a good, ripe Merlot from California with a spicy Rhone edge add by the Syrah and the freshness of the Sangiovese. The resulting wine is clean, rounded, nicely balanced and uncomplicated.